Vancouver, British Columbia / TheNewswire / January 17, 2019 - Vizsla Resources Corp. (TSX-V: VZLA) ("Vizsla" or the "Company") is pleased to announce that it has completed the acquisition of NorthBase Resources Inc. ("NorthBase")., previously announced on December 18, 2018. NorthBase is a private British Columbia company which controls a district scale (20,265 hectare) land package known as the Blueberry property (the "Blueberry Project"). Michael Konnert, President and Chief Executive Officer of Vizsla, stated: "I am pleased to announce the completion of the NorthBase acquisition. Vizsla acquired the company for its district-scale Blueberry Project which lies in the Babine porphyry belt of central British Columbia. The project offers significant potential for a new copper discovery. The Blueberry Project is contiguous with ML Gold's recent discovery at the Stars project." Vizsla now owns the Blueberry Project free and clear of any obligations, royalties, payments or expenditures. The 20,265-hectare Blueberry Project lies in a prolific copper-porphyry trend and is adjacent and immediately south of the Stars project owned by ML Gold Corporation ("ML Gold"). The project area has a significant mining heritage with past production at nearby mines such as Equity Silver, Bell Copper, Endako and the very recently closed Huckleberry mine. The Blueberry Project was assembled by the NorthBase team with extensive experience in copper exploration and development, including the mine geology at the Huckleberry open pit copper mine. Importantly, property geology is believed to extend southward into the Blueberry Project area based on interpretations of regional geophysical datasets2. The Blueberry property is approximately ten times larger than the Stars project and is underlain by prospective geology with numerous magnetic high anomalies in an underexplored till covered plain. Most importantly, recent detailed stream sediment survey results on the Blueberry Project are encouraging, with several anomalies highlighting large till covered drainages with associated magnetic high anomalies that may contain new, hidden porphyry copper deposits. The Blueberry property is located ~60 kilometres southwest of the town of Houston, British Columbia. The property falls within the jurisdiction of the Omineca Mining Division. The property benefits from ample access through a network of resource roads on the property. Geological information on the Blueberry project is limited due to a lack of historical geological data. However, given the proximity of the adjacent Stars property, which has detailed information on record, and interpretations of regional geophysical datasets, the geology of the Blueberry is likely similar. At the Stars property (from Lane, 2008): "The main lithological units present within this area consist of volcanic flows and tuffs of the Lower Jurassic Telkwa Formation and sandstones, shales and siltstones of the Lower Cretaceous Skeena Group (Desjardins et al., 1990). The northern portion of the property is bounded by plugs of the Early Jurassic Topley Suite (Robertson, 1999). A granodiorite (Gray, 2002) to quartz monzonite (Robertson, 1999) stock largely covers the central portion of the property. This stock is thought to resemble members of the Bulkley Intrusive Suite; a suite which includes regionally intrusive rocks commonly found associated with mineral showings. Longford Exploration Services Ltd. executed a fall 2018 stream sediment sampling program on the Project. The twenty-two-day program collected 182 stream sediment samples. This phase of the project was used as a primary pass analysis to vector in future exploration for potential copper porphyry mineralization. gold in the stream sediments collected. Additional airborne and groundwork is required to check on these anomalous zones of metal mineralization. Areas above/upstream of the samples with high geochemical results will be checked for visual mineralization, mapped and sampled. 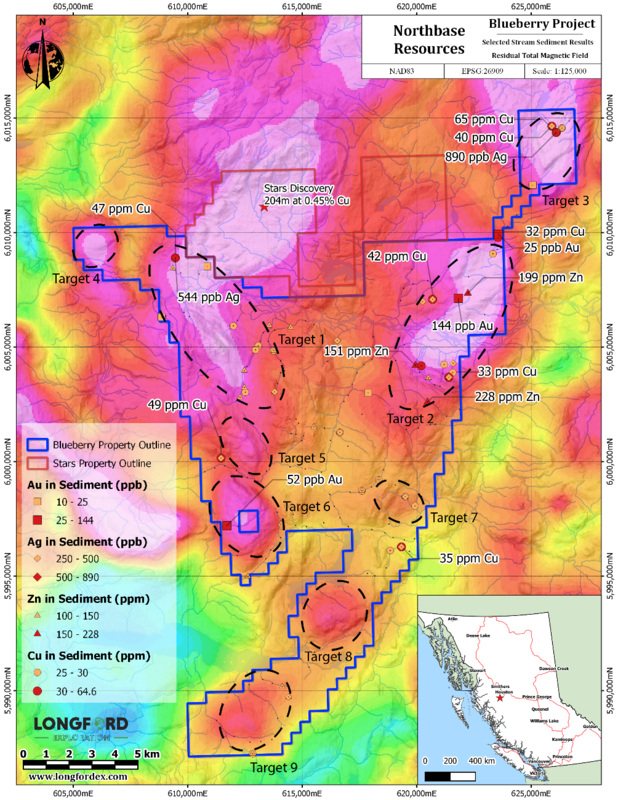 The zones of interest correlate significantly with highs on the residual total magnetic field regional geophysics demonstrating that doing higher resolution airborne geophysics would be helpful in targeting metal mineralization on this property. 5,000,000 of 9,100,001 shares issued to Northbase have been voluntarily escrowed for 3 years. Vizsla Resources cordially invites you to visit management at booth #637 at the Vancouver Resource Investment Conference (VRIC) to be held at the Vancouver Convention Centre West (1055 Canada Place, Vancouver) on Sunday, Jan. 20, 2019, to Monday, Jan. 21, 2019. Management will also be participating in a Copper CEO Roundtable at 11:40 AM on Sunday Jan. 20th. The scientific and technical disclosure contained in this news release has been reviewed and approved by Christopher I. Dyakowski, P.Geo., a qualified person, as that term is defined in National Instrument 43-101 -- Standards of Disclosure for Mineral Projects. Vizsla is a mineral exploration company engaged in the business of the acquisition, exploration and development of mineral resource properties. The Company has approximately 20,000,000 shares outstanding and has two exploration-stage projects in British Columbia. Vizsla's common shares trade under the symbol "VZLA" on the TSX-V. This news release contains "forward-looking information" and "forward-looking statements" (collectively, "forward-looking statements") within the meaning of applicable Canadian securities legislation. All statements, other than statements of historical fact, are forward-looking statements and are based on expectations, estimates and projections as at the date of this news release. Forward-looking statements include but are not limited to statements with respect to the activities or events or developments that the Company expects or anticipates will or may occur in the future, including, without limitation the anticipated exploration programs on the Blueberry Project and the results of such programs. Generally, but not always, forward-looking information and statements can be identified by the use of phrases such as "expects", or "does not expect", "is expected", "anticipates" or "does not anticipate", "plans", "budget", "scheduled", "forecasts", "estimates", "believes" or "intends" or variations of such words and phrases or stating that certain actions, events or results "may" or "could", "would", "might" or "will" be taken to occur or be achieved). Forward looking information and statements are based on current expectations, beliefs and estimates of management of Vizsla at the time such statements are made and are based on numerous assumptions, including among others the price of gold, copper and base metals, that financing will be available if and when needed and on reasonable terms, that the results of planned exploration activities are as anticipated, the cost of planned exploration activities, that third party contractors, supplies and governmental and other approvals required to conduct planned exploration activities will be available and on reasonable terms that general business and economic conditions will not change in a material adverse manner. Although the assumptions made by the Company in providing forward-looking information or making forward looking statements are considered reasonable by management at the time, there can be no assurance that such assumptions will prove to be accurate. These forward-looking statements. involve known and unknown risks, uncertainties and other factors which may cause the actual results, performance or achievements of Vizsla to materially differ from any future results, performance or achievements expressed or implied by such forward-looking statements. Such factors, among other things, include: fluctuations in general macroeconomic conditions; dependence on third party financing, uncertainty of the availability of additional financing, reliance upon key management, early stage nature of the Company's projects, fluctuations in securities markets and the market price of Vizsla shares; fluctuations in spot and forward prices of gold, copper, base metals or certain other commodities; change in national and local government, legislation, taxation, regulations and political or economic developments; risks and hazards associated with the business of mineral exploration, development and mining (including environmental hazards, industrial accidents, unusual or unexpected formations pressures, cave-ins and flooding); inability to obtain adequate insurance to cover risks and hazards; relationships with and claims by local communities and indigenous populations;; the speculative nature of mineral exploration and development (including the risks of obtaining necessary licenses, permits and approvals from government authorities), deficiencies in the Company's title to its properties. Although the Company has attempted to identify important factors that could cause actual results to differ materially from those contained in the forward-looking information or implied by forward-looking information, Vizsla cannot assure shareholders that actual results will be consistent with such forward-looking statements, as there may be other factors that cause results not to be as anticipated, estimated or intended. Readers should not place undue reliance on the forward-looking statements and information contained in this news release. Except as required by law, Vizsla assumes no obligation to update the forward-looking statements of beliefs, opinions, projections, or other factors, should they change. 1 Disclosure: Mineralization hosted any adjacent properties is not necessarily representative or indicative of mineralization hosted on the Blueberry Project.